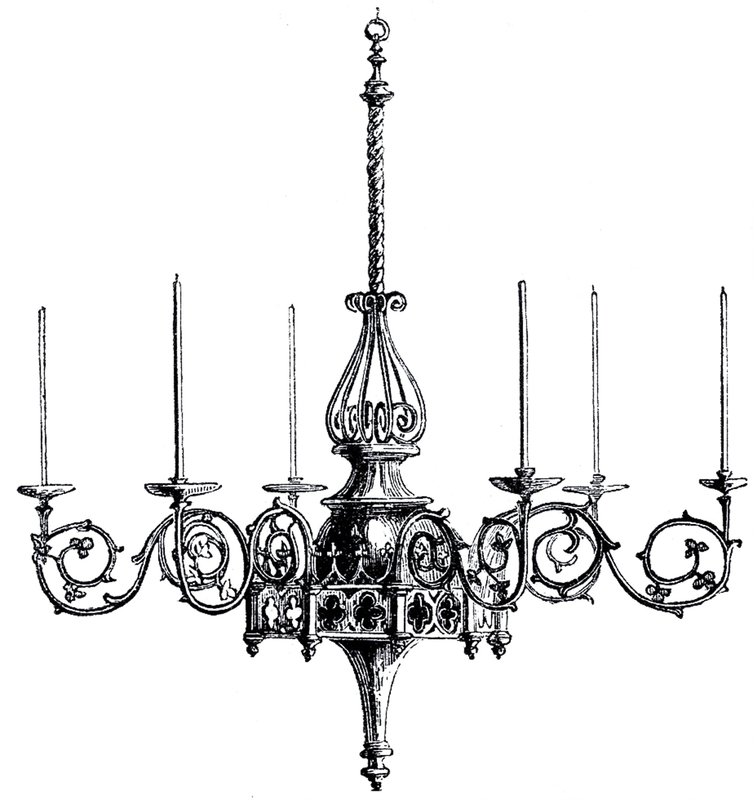 I am sharing an elegant collection of 7 Chandelier Images – FREE Clipart for you! The black and white images are just stunning. 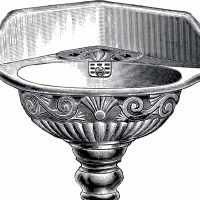 The antique engravings and woodcuts are highly detailed. The craftsmanship of each piece is splendid. Imagine how many hours of work it must have taken to create each chandelier. We begin our collection with multi-layered tall chandeliers. The ceilings must have been extremely high to carry off such large light fixtures. 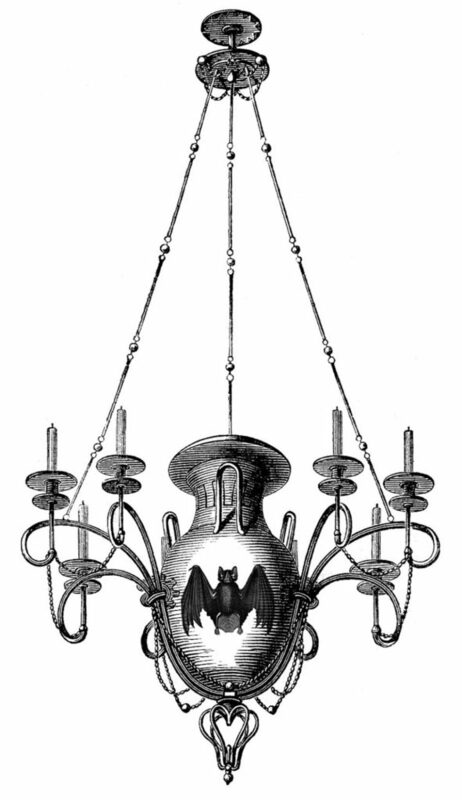 Then we have several fancy single layer Gothic chandelier images. These are every bit as elaborate as the larger ones, but would fit in less grand rooms. So nice to use in your Craft or Mixed Media Projects! Wouldn’t these look great transferred onto a Pillow? 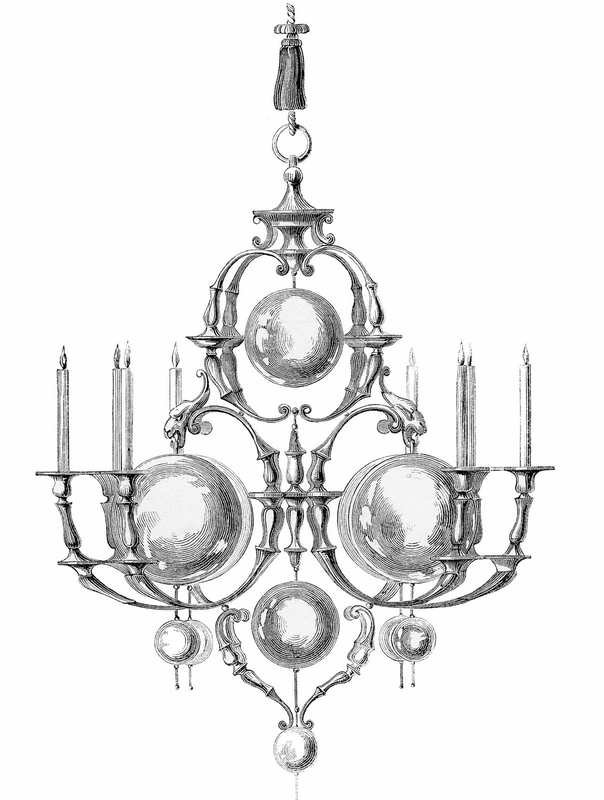 From an 1850’s catalog, we begin our Chandelier Images collection! This one is a beautiful engraving of a Chandelier all done in delicate leaves and flowers. A great garden style image! This is a very old Chandelier Image! These were scanned from a Circa 1828 Antique Printer’s Book. If you look closely it appears to be made entirely out of crystal, even the center portions. It must have been very fragile! So grand and elegant. Above is an interesting Vintage Gothic Chandelier! This one was scanned from a newer addition to my collection – a rare Circa 1846 Ecclesiastical Costume book. 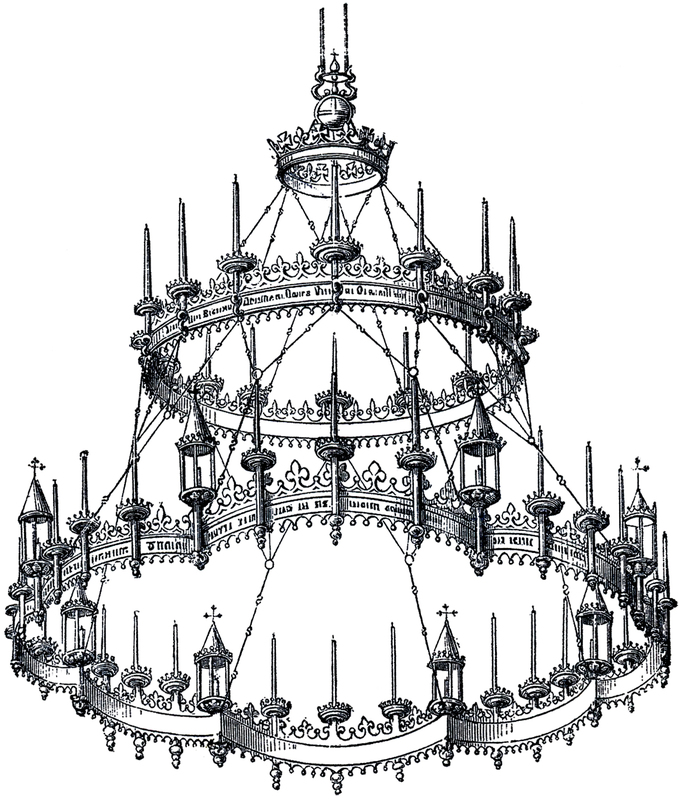 Shown here is a breathtaking old Cathedral Chandelier. It has two tiers full of Candles and a gorgeous Crown decorating the top. It holds candles. Just imagine the flickering light dancing around the cathedral. Such a beautiful piece! The one above also comes from the 1850’s Catalog. I think the round orbs are actually glass balls. They look like bubbles to me! This one also has candles. I would love to have this one in my garden to light Summer picnics. These Chandelier graphics are from an 1870’s book that I picked up recently. The original is the center chandelier image with a Grecian Lady on it. I had a bit of fun and replaced her with a Bat in case you would like to use this for your Halloween DIY projects! I have also included a blank one so that you can add whatever image you like or use it as is. I love that they have a Gothic look and feel and that they use candles. 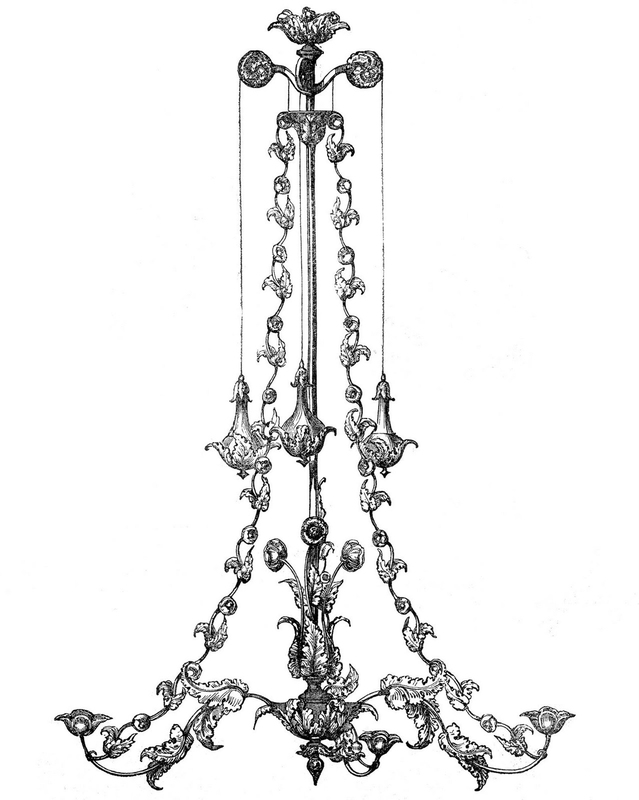 Our final drawing in the collection is a Vintage Gothic Chandelier Image! This one was scanned from an Antique Circa 1860’s London book. 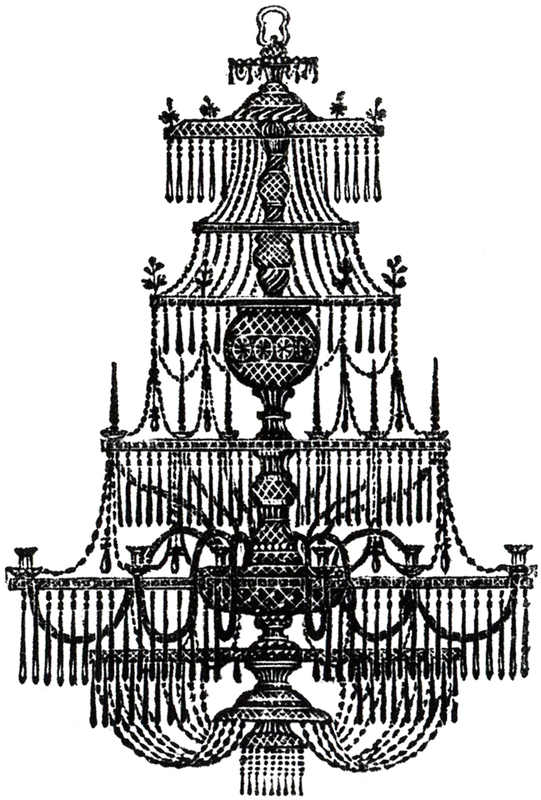 It’s an old Engraving of a Chandelier that has some very ornate details. I thought it looked quite Gothic. Perhaps it was made for a church. It is truly a lovely lighting fixture, but I also think it could look spooky in the right setting. I hope you enjoyed this curated collection of 7 Chandelier Images! You might also like our 10+ Most Popular Vintage Crown Images or our 75+ Best Free Vintage Halloween Images HERE! « 10 Valentine Children Images! Thank you for these lovely old images, Karen. I have added some of them to my Halloween folder to print out for my Halloween journal.